John Key takes on a new role of Minister for National Security and Intelligence and will leave the signing off of warrants and day to day management of our spy agencies to Chris Finlayson. This will undoubtedly give Key more flexibility in focusing on his front of camera, celebrity approach to being Prime Minister. 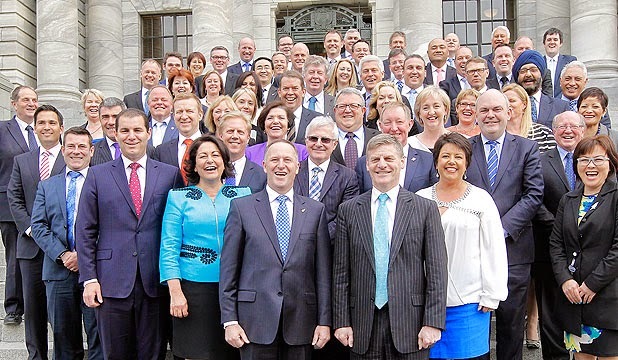 There are still only six women in a cabinet of 20 and Paula Bennett has become Collins' successor as the top ranking woman (previously below Parata and Collins). Her Finance responsibility points to her being seen as a possible leader in waiting. It will also be interesting to see how she manages the fraught area of social housing and whether she attacks the unhoused with the same enthusiasm as her cuts to beneficiary numbers. Hekia Parata keeps her previous portfolio despite a rocky term as Education Minister and two court rulings over-riding her decisions, but drops from 7th to 10th. Anne Tolley takes over the Social Development portfolio after a reasonable job with Police and Corrections but struggling with Education previously. This may be a challenge for her given the pressures around child poverty and low incomes. Tolley's reactionary style of management may inflame issues that need sensitive handling. Dr Jonathan Coleman has risen from 10th to 6th place and takes over Tony Ryall's Health responsibility, at least he does have a background in health as a medical doctor. Amy Adams has leapt from 15th to 7th and takes over Justice and Courts and is ranked ahead of the Attorney General, Chris Finlayson. Gerry Brownlee retains his earthquake responsibility but loses transport. He has struggled to effectively counter Julie Anne Genter's superior grasp of transport issues and has been given Defense instead. Given the new defense challenges ahead perhaps Key has seen the need for bluff and bluster to front future decisions regarding our armed forces. Stephen Joyce now becomes the Minister of Regulatory Reform. This does not bode well for the next three years if this new portfolio supporting change is going to be fronted by National's expert at damage control. National's young gun, Simon Bridges has leapt from 18th to 9th and is taking on Transport. This will be challenging as the underspending on public transport and cycling becomes more obvious and the Roads of National Significance become harder to justify. With greater global concerns around climate change it will be interesting to see how hard he continues to advocate for the oil and coal industries. Chris Finlayson remains in 8th place and his new roles as Minister for the SIS and GCSB is an interesting one. This is a huge shift from the tradition of only the PM holding this role and this gives Key a very light Ministerial load when this responsibility is shared and allows Key to further distance himself from troublesome issues. For Tim Groser and his portfolios of Trade and Climate Change to drop from 14th to 16th in the Cabinet is another indication of where this Government places carbon emissions in their list of priorities. Groser is one of the few who openly accepts the science behind climate change and he has dropped in the rankings. His logical support of the science must be seen as a disadvantage. I would have thought trade should be given greater status too. Bill English takes over the Housing New Zealand responsibility. When you consider that Paula Bennett is dealing with social housing it appears that the HNZC will be regarded by English in a business sense. Bennett's approach generally involves reducing demand for social support and English has a background in selling off assets. It appears that the Government will continue to sell off state housing around the country and Paula will promote the idea that few people need housing support while refusing to measure the extent of the problem. Nick Smith goes up one place in his rehabilitation after being dumped for his ACC conflict of interest fiasco and regains Environment. The Environment is probably best managed by Smith than any other of his colleagues as he does have the most knowledge of this area. He will have a difficult job ahead to get enough lower cost housing built to meet demand, up until now none have been built. Nikki Kaye takes on the major responsibility of ACC and goes up 4 places to 15th. Kaye has a softer image in the house compared to the other female Ministers and it will be interesting to see how she manages tough questions as a higher profile Minister. Murray McCully continues with Foreign Affairs and Sport but drops two places. Nathan Guy has struggled to be on top of his responsibilities but with no other farmer high on the list he remains in charge of Primary Industries. National probably needed to have a Minister for Manufacturing now that dairy prices are tanking. Michael Woodhouse has gained 3 places and takes over what was the Minister for Labour but now is called Workplace Relations and Safety. He will probably have to deal with the aftermath of Joyce's regulatory reform that will see workers' meal breaks become not compulsory and collective bargaining becoming optional for employers when things don't go their way. At one time the Minister of Labour always went to one of the higher ranking members of cabinet, but now that workers have become a business commodity (and much is casualised), unions no longer need to have high powered management. Sam Lotu-Iiga is 19th and is in Cabinet for the first time and he will look after Ethnic Communities, Pacific Peoples and Corrections. Todd McClay is another new Cabinet Minister and will be responsible for State Owned enterprises and Revenue (up 5 places). The acid tongued (during question time anyway) Maggie Barry also reaches Cabinet level with responsibilities for Arts, Culture and Heritage, Conservation and Senior Citizens. Louise Upston, a confident performer in the house and often is used to ask patsy questions to deflect opposition attention from Ministers under attack. Paul Goldsmith, who has loyally stepped to one side to allow ACT have an MP and buffer for his party. Judith Collins, who is now seen as a serious liability and as a back bencher we may see some entertaining tweets as she attempts to address the boredom. Craig Foss, who just misses out and has to manage small business, statistics (that recently had its funding cut and its work is not helpful when attempting to down play concerning data) and Veterans' Affairs.